This is always a special show for me because I invite a number of my broadcasting colleagues at the radio station to play music for which they’ve been thankful during the past year. I think it makes all of us at the station even more thankful for the opportunity to play music we love for our audiences. (For more info about the broadcasters, go to wmnr.org) And because this show always comes around my birthday, I’m also joined every year in the studio and on the air by the people I am most thankful for – my wife and my son. Want to know what else you’ll be thankful for? Listening to a Turntable For One podcast on PRX, the Public Radio Exchange. It’s the reason you have ears…unless you don’t have ears in which case I’m sorry I brought the whole thing up. Click the link below to see what you’re missing. No hint necessary this week! 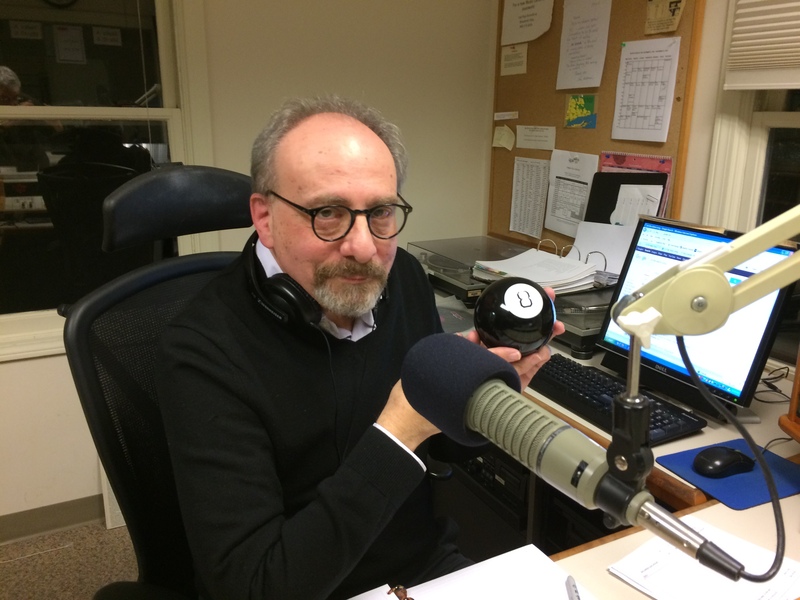 It’s my 6th Annual Music To Be Thankful For program, a post-Thanksgiving Day music party featuring special appearances and suggestions from some of my fellow broadcasters at the radio station. What music are you thankful for this year? Still hungry for more turkey? Try gulping down a few Turntable For One podcasts on PRX, the Public Radio Exchange! Click the link below. Sondheim wrote, “The choice may have been mistaken, but choosing was not.” Makes sense, but weighing all the choices, all the “either/ors,” can be tricky. In an attempt to answer some of life’s biggest questions (and who isn’t trying these days? ), I brought in a new consultant for the evening (pictured below). It didn’t help much. But before the usual silliness began, I opened the show with Jacky Terrasson’s exquisite, heartbreaking La Marseillaise, just in case there was a heart somewhere not broken enough. Want to know another way to keep the music playing? Listen to a Turntable For One podcast on PRX, the Public Radio Exchange. Click the link below. Will Turntable For One play some great jazz vocals this week? “It is decidedly so.” And will it be another great show? “Can not predict now.” Uh-oh. Not the answer I was hoping for. Are you sure this thing really works? Did you miss a show? Lucky for you I don’t take attendance. Double lucky for you that I post Turntable For One podcasts on PRX, the Public Radio Exchange. Don’t just sit there – start clicking! Once again Turntable For One goes where no other radio program goes and, as usual, I forgot to bring a map. But I thought it was time that someone told the audience the facts of life. And, as you can see, I had some impressive help. Here’s one of the better facts of life: you can listen to a Turntable For One podcast anywhere, anytime, day or night (except maybe when you’re in surgery). Click the link below to go to PRX, the Public Radio Exchange.